Planning to run user acquisition campaigns through ad networks like Tapjoy, Chartboost, or Vungle? Well, even if you’re looking to use one of the major advertising networks, your app installs could actually be coming from one of their affiliates or partners or their affiliates’ affiliates or their affiliates’ affiliates’ affiliates… You get the point, right? By understanding ways to prevent mobile ad fraud, you can spend your UA budgets more strategically and grow your apps faster. These affiliates of affiliates of affiliates could be generating fraudulent geo-manipulated installs, simulated conversions, click spam, or hyper engagement which all results in your user acquisition budgets going down the drain. There is some good news – by utilizing transparent networks, install models, and tools, you can prevent mobile ad fraud and grow your app quickly and sustainably. When developing this article, I reached out to the top DSP network to ask whether or not developers know what network their ads were actually served on. The reply back was… lackluster to say the least. “Thank you for reaching out. This is not typical situation but I think it is technically possible” is all the email read. Why is it not the typical situation? This company has over 30 partners and those partners have even more partners. You don’t really know who is delivering the install and therefore who is getting paid for that. I don’t know about you, but I like to know where I’m spending my marketing budgets! How do you combat this? Use transparent ad-tech partners who allow you access to where your installs are coming from, what companies are driving them, and which companies are top performers – all of which help to prevent mobile ad fraud. Companies like Appnext promise “with Appnext you know exactly which apps you promote, where your own apps are promoted, which partners perform best, and the best bid for each of them.” which could be the reason they’ve tripled year-over-year revenue for 2016. I remember when I first started at an app company and they started throwing around all of these acronyms. I was lost in a landmine of CPA, CPI, and CPM. CPM (cost per mile – which then had me saying “what the heck do miles have to do with bidding for installs! ?” – which really means cost per 1,000 impressions) will get you the most eyeballs – but eyeballs don’t mean installs and they definitely don’t mean quality installs. CPI bidding will only charge for installs – which means you’re only spending on those who install and potentially become valuable customers for your app – which is better but not the best. The top solution to getting quality downloads when bidding is to set up a CPA campaign – which is cost per action (not acquisition as seen in some cases). While setting up these actions within your app, be sure they’re actions that lead to engaged and retained users. Many ad networks allow users to bid on a CPA basis including Tapjoy, Facebook, and Liftoff Mobile but these installs tend to cost more as they’re (hopefully) generating top tier users. Users must actually get to a certain point within the app like level ten or completing a registration for the network to get paid, which intrinsically helps to prevent mobile ad fraud. Okay – that was a throw to Tim Ferriss’ newest book but really we’re talking about mobile attribution platforms. If you’re looking to use a variety of networks, and we believe you should ABT (always be testing!) and using a mobile attribution platform like Appsflyer or Adjust. Oreon Kaniel, CEO of Appsflyer who recently raised $56 million in a Series C round, stated “I basically saw spray and pray, marketers spraying budgets and hoping for the best” – which I don’t suggest you do with your campaigns. 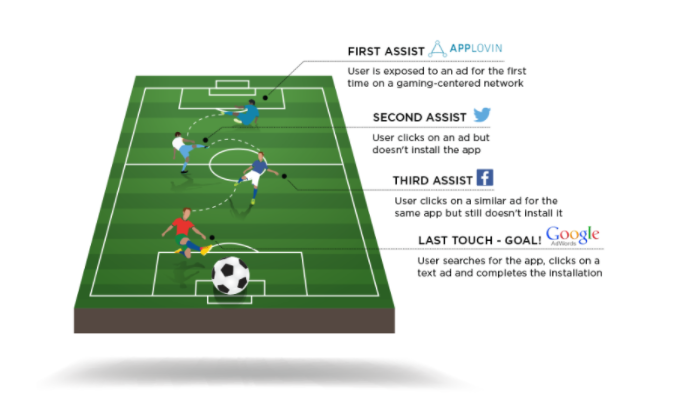 Appsflyer breaks down their Multi-Touch Attribution. Appsflyer measures the performance of app install ads including Facebook posts (organic and paid), user invites, email campaigns, and more. This means not only can you see the ROAS of each campaign, you can see what company generated the install and what country the install originated from – all of which helps dramatically prevent mobile ad fraud. As Ad-Tech grows in 2017, be sure you’re protecting your mobile apps while you scale your growth.